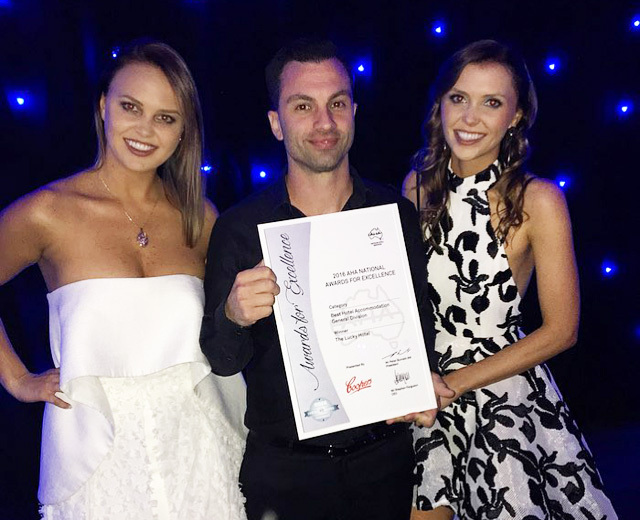 The Lucky Hotel has won Best Hotel Accommodation – General Division at the 2016 AHA National Awards for Excellence, which was held on the Gold Coast on Monday 19 September 2016. The Lucky Hotel was the only venue from Newcastle to be nominated for three national awards. The winners from each category were applauded by hotel industry leaders, hoteliers, special guests, and parliamentarians who attended the special evening at RACV Royal Pines Resort to celebrate all aspects of Australia’s vibrant hotel and hospitality sector. The Lucky Hotel underwent major renovations in 2014 and has won multiple awards over the past 24 months. The Lucky Hotel is owned and operated by the McCloy family.